Rex Tillerson said countries outside of the region could also play a role, primarily by shunning the powerful Revolutionary Guards, which play a major role in Iran’s economy. 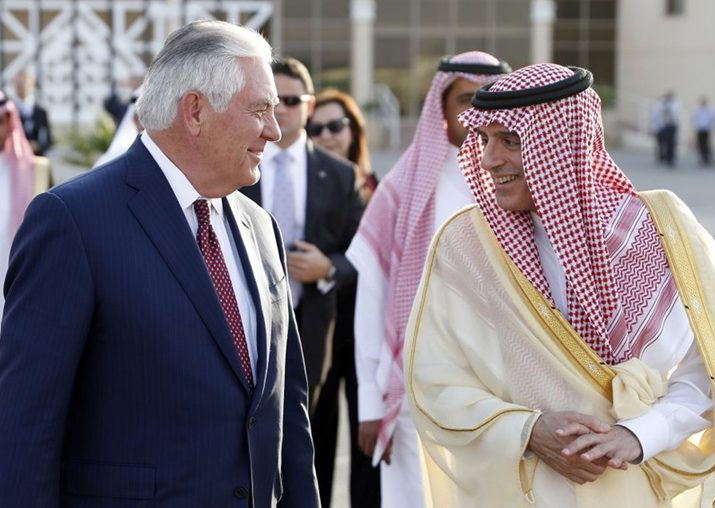 US Secretary of State Rex Tillerson on Sunday pressed the Trump administration’s case for isolating and containing Iran in the Middle East and beyond as he pushed for Saudi Arabia and Iraq to unite in common cause to counter growing Iranian assertiveness. He called for the removal of Iranian and Iranian-supported militias from Iraq and urged other countries, particularly in Europe, to halt any business they do with Iran’s Revolutionary Guards. “We are hoping European companies, countries and others around the world will join the U.S. as we put in place a sanctions structure to prohibit certain activities of the Iranian Revolutionary Guards that foment instability in the region,” Tillerson said. Earlier, at the coordination committee meeting, Tillerson told the Saudi king and Abadi, that the event highlighted the improving ties between the longtime rivals and showed “the great potential” for further cooperation. He noted the August reopening of a major border crossing and the resumption of direct flights between Riyadh and Baghdad.